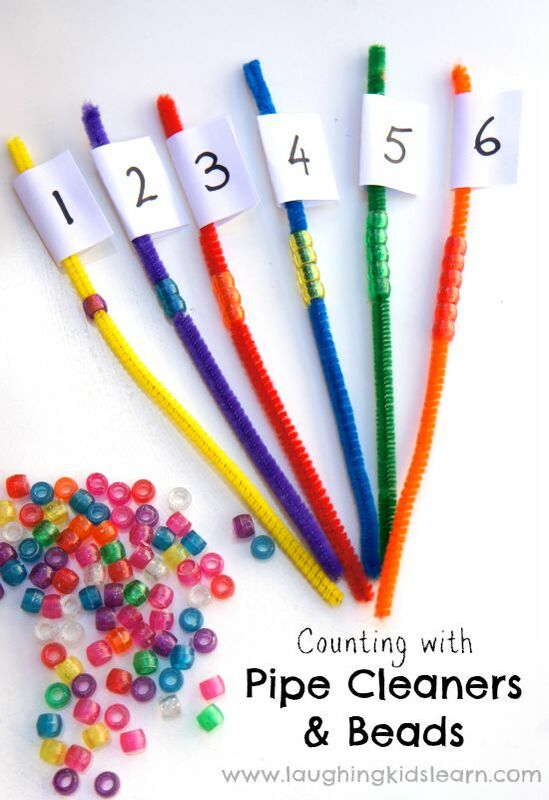 Using colourful pipe cleaners and beads you can set up a fun counting maths activity for kids. 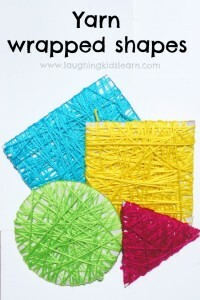 This is also really great for fine motor development and when it’s complete you can simply turn it into a busy bag that can be done at another time. 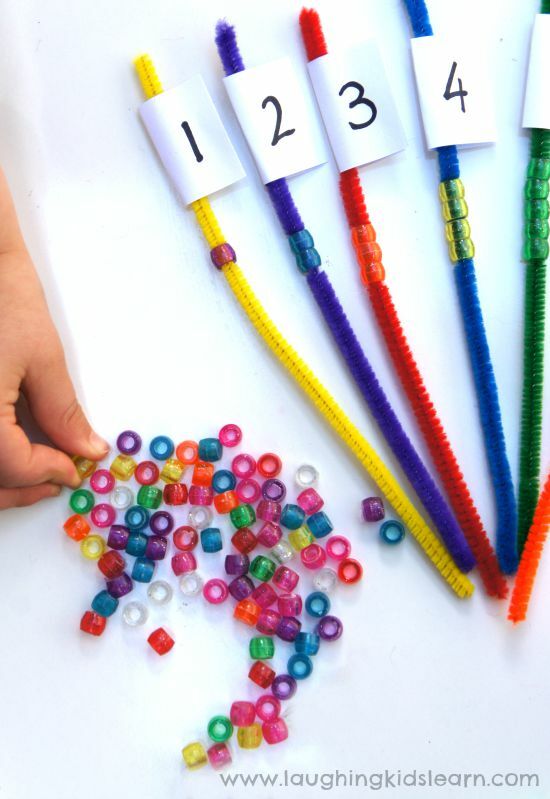 Counting beads on pipe cleaners might seem simple enough, but it is the perfect activity for children who are at the early stages of developing their numeracy skills. Possum (aged 3.5 years) is really into beads at the moment and so I couldn’t wait to give this popular maths activity a try. She is quite familiar with many number names to 10 and ordering them, however, I was keen to see how she was able to represent the numbers to ten by creating them using beads on a pipe cleaner. 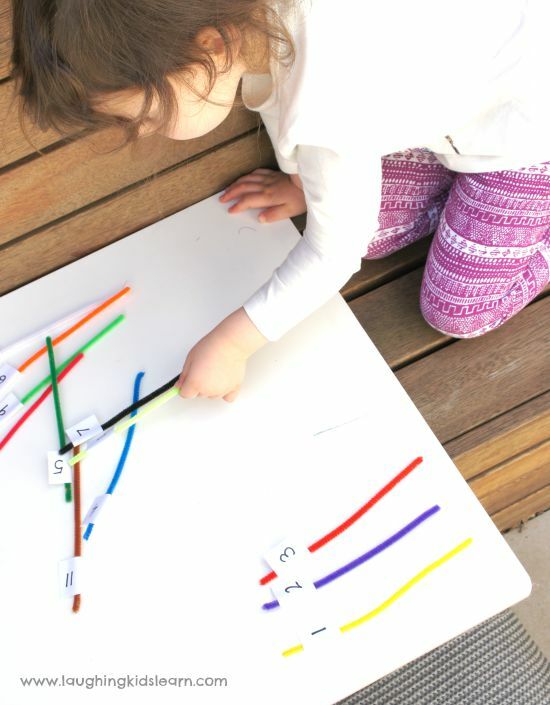 This turned out to be such a fabulous and fun math activity that we have done it many time since I took these photographs. 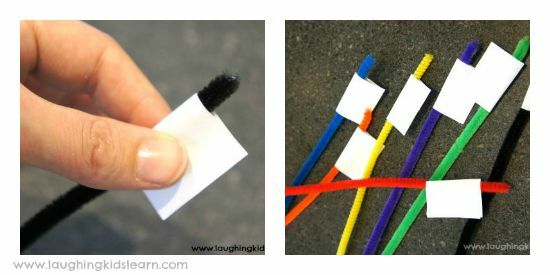 Begin by folding a piece of paper around one end of each pipe cleaner and fixing it in place with a swipe of your glue stick. 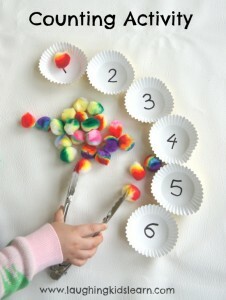 Depending on the age of your child and their skill level, write a number on each piece of paper. I wanted to help develop Possum’s understanding of numbers to 12 so I wrote 1 – 12 on each piece of paper. 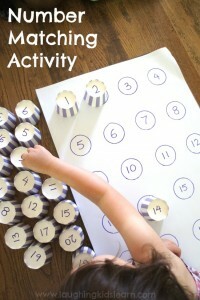 This math activity is flexible enough that you can cater it to suit your own child’s needs and skills. I thought it might be a bit of fun to have Possum place the pipe cleaners in numerical order. It was wonderful to watch her take the time to think about the order of the numbered pipe cleaners and encourage her to adopt good counting strategies, such as counting on and checking what she had already done. Of course your child might choose to sing a number rhyme or matching numbers written down somewhere nearby. 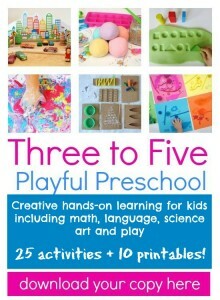 They are all great ways for your child to be supported in their learning. I took a moment to have Possum trace her finger over each of the numbers for a bit of revision. 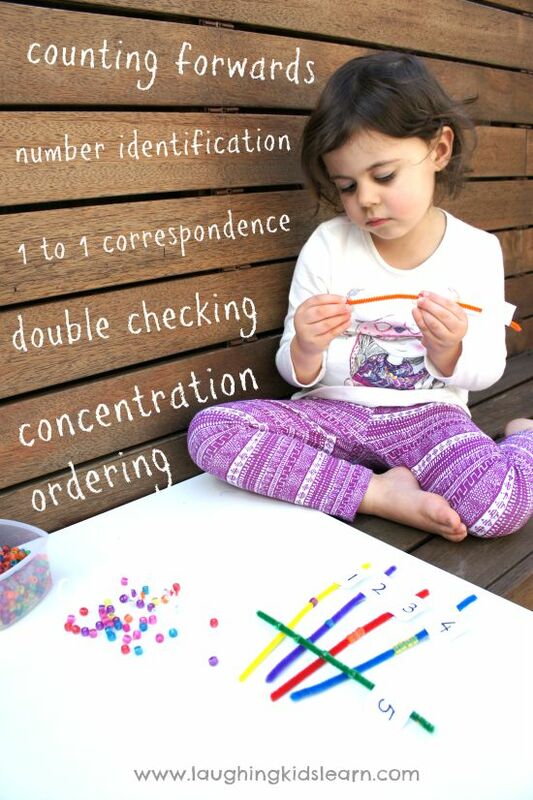 Even though she wasn’t tracing the numbers in a way that one would write it, it was a great way for have her focus on the features of each number. We laughed about how some of the numbers had straight lines and others had curvy round bits. Soon enough the beads came out and Possum instinctively went about threading on the beads to represent the number attached to the end of the pipe cleaner. To ensure she didn’t become too overwhelmed I only allowed her to have 2 or 3 numbered pipe cleaners at a time. 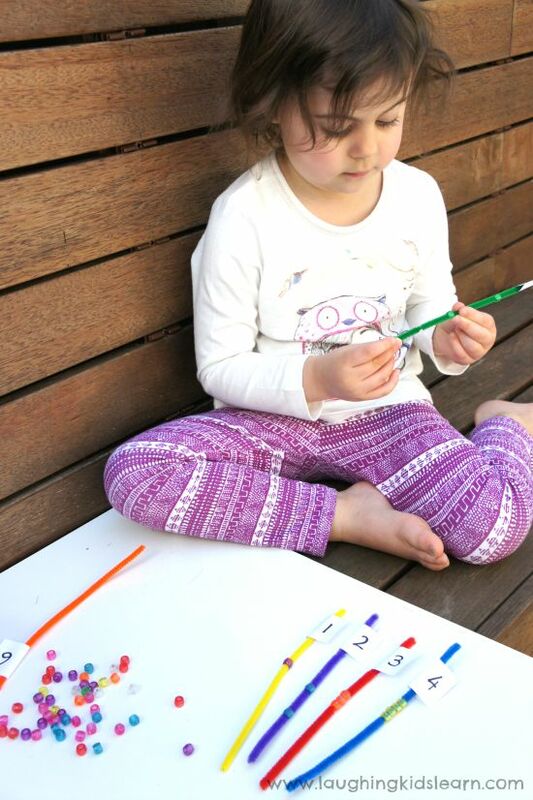 This maths activity of counting beads onto pipe cleaners is also a fabulous way of developing your child’s fine motor skills. 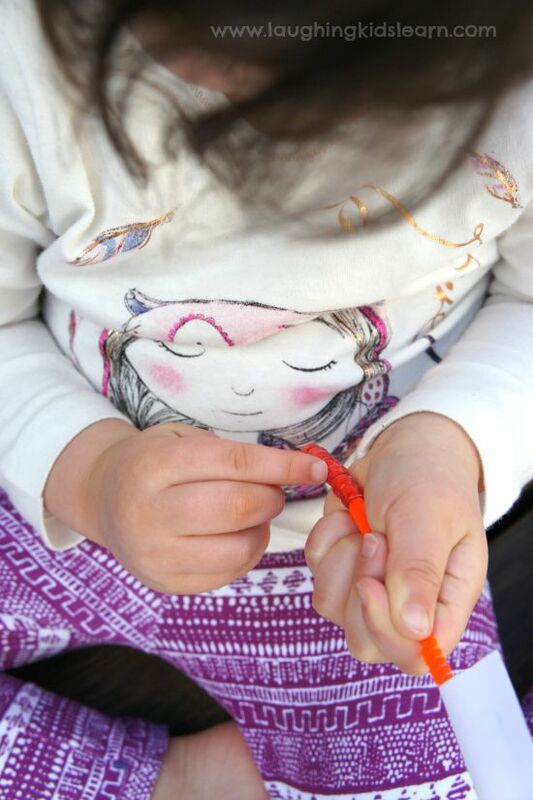 The process of threading the bead onto the pipe cleaner requires a steady hand and also great hand and eye coordination. This activity really does give all those things a great work out. Maths can be so tricky because there is rarely a grey area, you either have it right or wrong in many cases. One thing I’d really love Possum to be great at is double checking her answers and I think it’s a skill that should be encouraged early on. Here Possum is double checking how many beads she has placed on the pipe cleaner. Possum is a little like me in the sense that she finds comfort in things being orderly and organised, so I wasn’t surprised when I saw her using one colour for each of the pipe cleaners. I did encourage her to use patterns but it wasn’t something she was interested in, however, your child may. We did do lots of talking about colours and how they would look if they were mixed together. 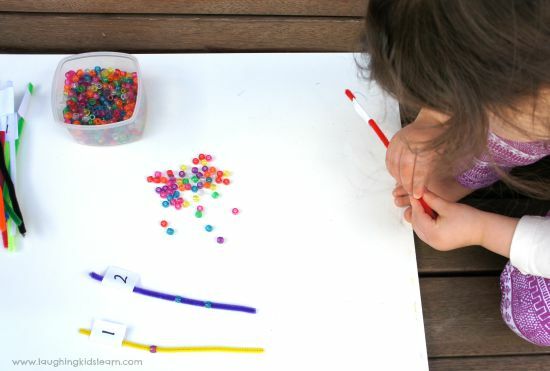 You might like to play a game with your child that has them counting the number of beads you have placed on the pipe cleaner and them saying (or writing) the number they believe it to be. 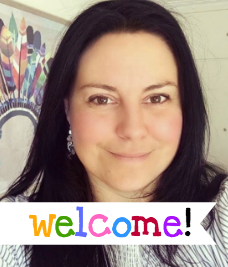 Another way of making maths fun and turning learning into a game. 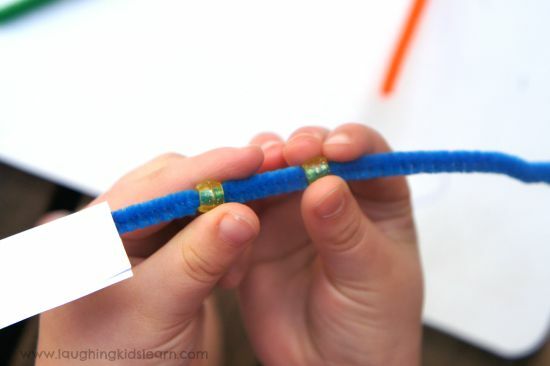 It’s amazing how a math activity that involves counting beads on pipe cleaners can open up so many other learning opportunities. 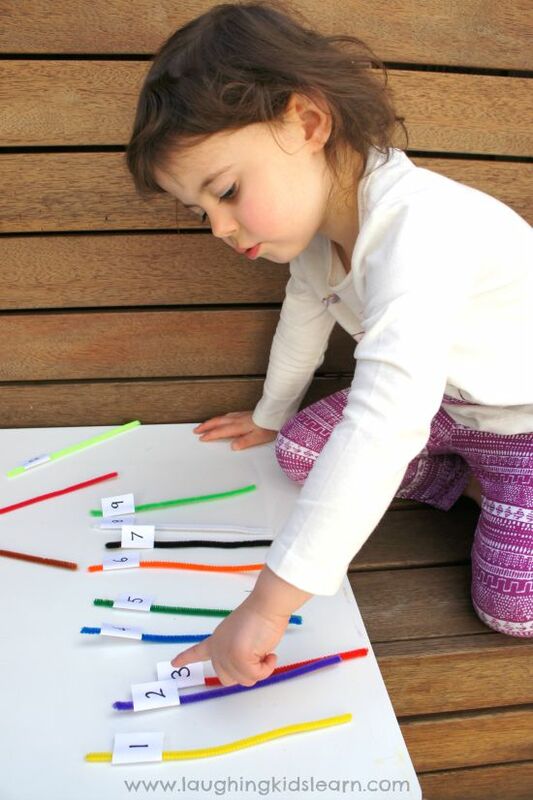 Fine motor development, ordering numbers and naming colours to name just a few. We had lots of fun with this maths activity and even turned it into a quick busy bag maths activity to play on another day. 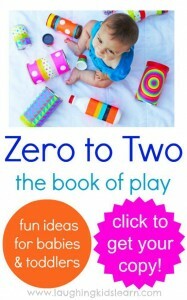 Do you think your child would enjoy this fun maths activity? What great fun! I love the variations too! Oh I know a little someone who would love this! Thank You for this Idea. Since My Little One is still learning his numbers what I did was. 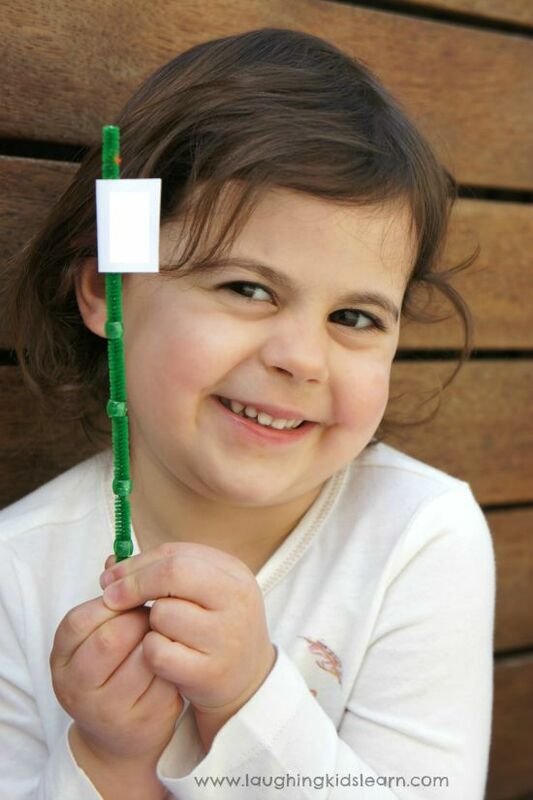 I did the numbers 1 – 10 and under each # I wrote out its name underneath on the little paper flag. Then we [His bigger brother (age 6), him and I) added the correct number of beads. Then I twisted the bottom of the pipe cleaner at the bottom. So now he can learn to count the number of beads on each one. Then when he gets that down pat i can untwist the bottom and have him add the correct number of beads to each pipe cleaner.